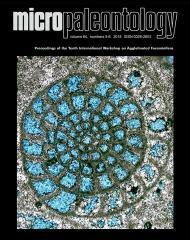 ABSTRACT: Larger agglutinated foraminifera resembling the Cretaceous genus Navarella Ciry and Rat 1951 were recently recovered in Thanetian hemipelagites from the Belluno Basin, northeastern Italy. These lituoids first appear in the basal Thanetian (uppermost calcareous nannofossils Zone CNP 8) and become common in the >500 micron washed residue from the uppermost Thanetian. They abruptly disappear at the Paleocene/Eocene boundary, in coincidence with the extinction of Paleocene small benthic foraminifera (the benthic foraminiferal extinction event - BEE). In order to document the internal chamber arrangement and the agglutinated wall microstructure of the Thanetian lituolids and to compare them with similar individuals recovered from the Upper Cretaceous and Danian strata of the same section, the collected specimens were sectioned and analyzed using a Scanning Electron Microscope (SEM), equipped with an energy-dispersive X-ray spectrometer (EDX). Our results show a typical bi-layered wall microstructure in the Thanetian specimens, whereas the older Maastrichtian and Danian specimens, occurring in the same section, display a single, thicker agglutinated wall. The taxonomy of the Italian lituolids is discussed and compared with similar taxa known from the literature. We describe the Thanetian lituolids as the new genus Neonavarella, which shows an apparently identical external morphology to mono-layered Maastrichtian-Danian specimens but differs in the microstructure of the agglutinated test wall that is bi-layered. The finding of new and well-preserved material from the Paleocene Scaglia Rossa beds of Italy helps shed light on the taxonomy of the still poorly known deep-water larger lituolids.